Charming 1888 Victorian, beautifully restored; cushioned window seats, 60' flat screen media room, wet bar with fridge, two separate offices, great old upright piano, large fenced yard with hot-tub & deck, outdoor and indoor dining areas, BBQ and views of Aspen mountain. Walk to music tent, gondola, restaurants, farmers market, shopping and access to all bike trails. Dennis is a retired maritime lawyer and Leah is a practicing pediatric neuropsychologist; we raised our children here and some of our best times were had here; we hope you have some of your best times here too. large hot tub, for up to 8 in back yard. Awesome house - close to town and slopes! We just got back from our stay at this house and had such an incredible time! The house was very comfortable and fit our 9 person group perfectly! The house couldn't be in a better location and is a short 10 minute walk into the center of Aspen and the gondola that takes you up to Ajax mountain. Not only was the house amazing, but Dennis, the owner, was very helpful and always willing to offer suggestions or help us out with any questions. We would definitely stay here again! I am so happy that our Aspen house worked so well for you; I only wish we had been there to show you around. Aspen is a town we love to share; it never disappoints. Take care and come back soon. The house was lovely and Dennis & Leah are a dream to work with. You were great guests and welcome back any time. In fact you are invited to consider our beach homes in Malibu VRBO 41889 and Cabo, VRBO 1100000 where you would enjoy the same warmth and service in a very different setting. What a great fit; you were wonderful guests and we appreciated being able to enjoy afresh, through you, the things about Aspen and our home in Aspen that make it such a very special place; we wrongly thought only grandchildren could do that. Spent a long weekend here in January 2018 and it was great. The location of the house is fantastic (right in town) and the house itself had everything we needed (comfortable bedrooms, living space, nice kitchen). The owners are quickly responsive to questions and very easy to deal with. I would definitely return. We are so happy you enjoyed your stay. Next year we’ll try to have more snow for you. Come back soon. We are a group of guys from California, New York, Texas, Norway, and Sweden who have our annual reunion once a year in Aspen. We have been doing this every year for 7 years and most of those years we have stayed here. We love it! Especially for a group of people who are all independent and prefer to come and go as we please, this is the perfect location. It's a 10 minute walk to everything in Aspen, including the gondola on Ajax. 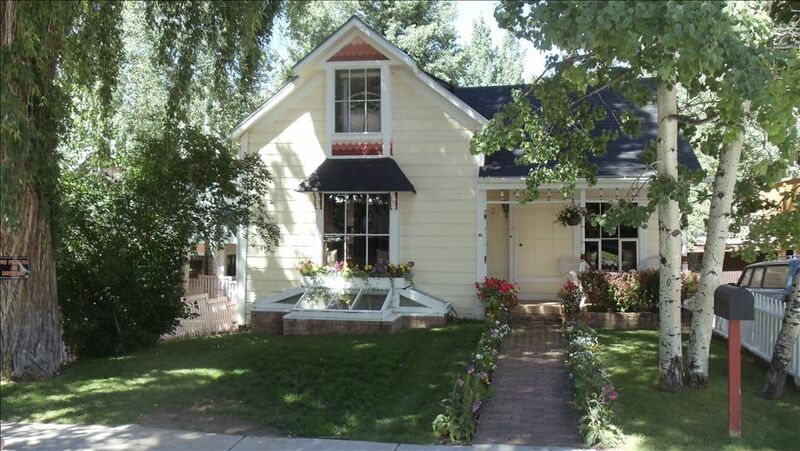 It's a 2 minute walk from the bus stops to Highlands and Snowmass. 1. The front porch. This is where we spend most of our time looking straight up onto the runs and chatting with anyone that walks by. Often locals walking by will join us for an hour or two. We'll pull out a chair for them and offer them a cold one. 2. The hot tub. Every morning before breakfast and every late afternoon after skiing this is where we soak and get relaxed and ready for our next adventure. 3. The fire place. Nothing like a big fireplace in a small living room. Late in the evening when everyone is back we're all gathered around it telling tall tales. 4. The Sonos. Music is absolute key to setting the mood and all of us have Sonos at home so it works out perfectly, except when battles start over who's controlling the music. Big thanks to the owners who are always warm, friendly, accommodating, and all-round great hosts! What a great review; AWESOME! This home is exactly what anyone needs if they are planning on traveling to Aspen. Although from the front the house looks quite small, it was very large and spacious once inside. It has wonderful views and is SO close to Aspen Mountain. Just a few short minute walk downtown and a 5 min bus ride to Buttermilk Mtn. The hosts were extremely accommodating and generous. 10 out 10 would recommend staying here. We can't always be in Aspen ourselves but we certainly enjoyed your experience vicariously as if we were there. Thank you for coming and thank you for sharing your experience; we look forward to your return. Four blocks from the city center, six blocks from lift 1A and eight blocks from the gondola lets you do it all but when the day is done 1888 victorian charm makes you feel right at home; four bedrooms, three baths, wood burning fireplace, wet bar, entertainment center, cozy window seats and outdoor hot tub round out the amenities.